Jose came to the Mission in severe pain. He was homeless, yet employed at the racetrack when an accident with one of the horses occurred. Jose’s arm was broken at the elbow and his teeth were in bad need of repair. Tony was in his late twenties and three weeks away from graduating Salvation Army’s recovery program. He was going to need to begin searching for a job soon. But when he arrived at Bethesda’s Dental Clinic in pain from an abscess, it was clear that the condition of his front teeth would severely hinder his chances of landing a good job. In spite of Tony’s terrible oral health, his attitude was wonderful. One volunteer dentist went above and beyond for this young man, and we were able to fix all of Tony’s front teeth which were badly decayed due to heavy drug use. He looked like a new man. Tony’s smile was incredible and it truly helped him reenter the community. The Lord’s hand was surely in this opportunity to change a life. 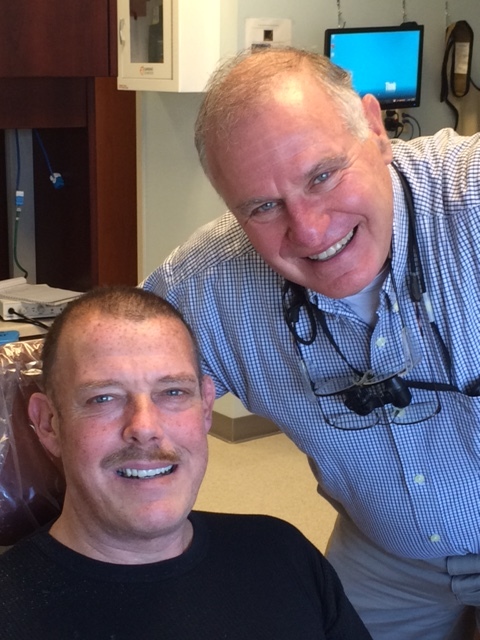 Dr. Deitman is a retired dentist who volunteers at Bethesda’s Dental Clinic. He has struggled with his health over the past few years due to an accident, but in between surgeries and physical therapy, he is always asking when he can volunteer next! He’s been here on crutches, a walking boot, and a knee brace, but because of his love for the Mission, the guests, and his profession, he still comes. 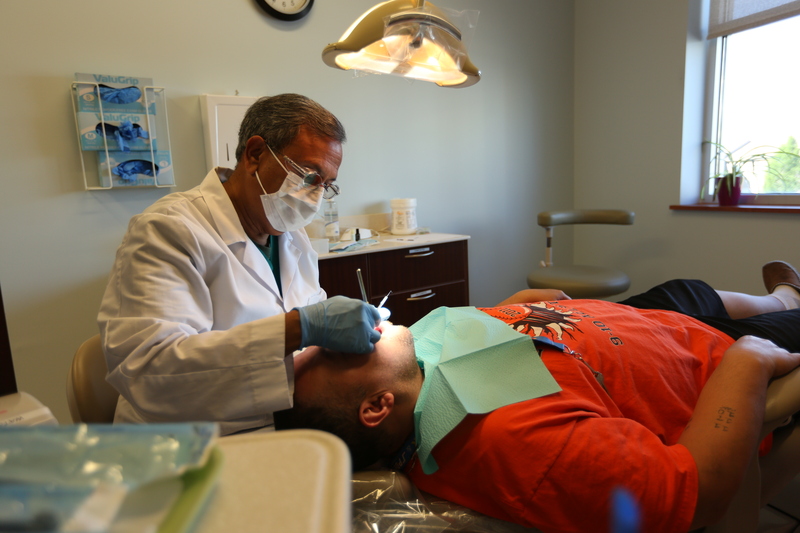 For years, we sent patients to one local dentist for emergency extractions, but he retired. Suddenly, we found ourselves without a way to perform this important procedure! God saw our need and provided Dr. Arndt, a fairly new volunteer dentist who comes every three weeks to do extractions (especially for impacted wisdom teeth) and prepare for dentures all day without a complaint. He sees 8-10 people every time! Jane is our on-staff dental hygienist. She is always committed, professional, and compassionate. In spite of only working part-time hours, Jane has been supervising students from HACC for three semesters now as they learn and practice their skills at our Clinic each week. Her skills and experience have been so valuable to both us and the students that she has since become an adjunct professor as well! 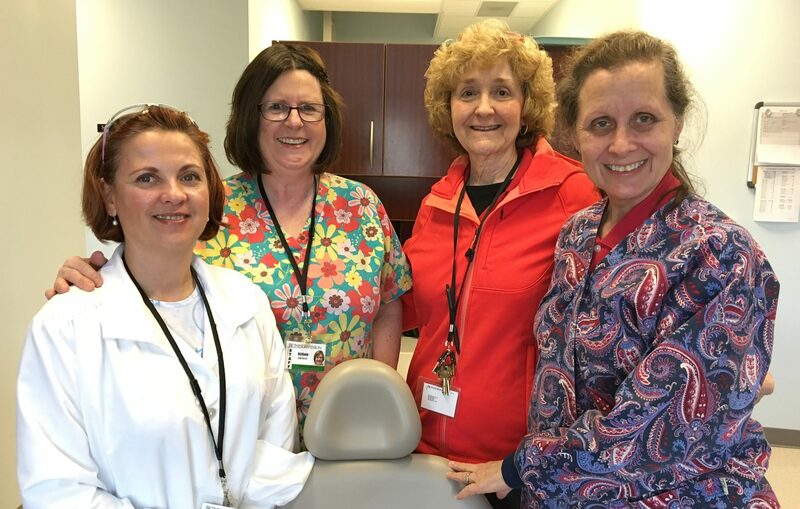 Bethesda Mission’s Dental Clinic rests on this three-legged stool: our homeless and uninsured guests, volunteer dentists, and part-time dental staff. All three are essential and all three have amazing stories to tell. The value of a person’s oral health on his or her general health cannot be underestimated. Tooth decay and gum disease lead to bacterial infections, difficulty eating, and have even been linked to heart disease. Not to mention the societal and occupational barriers that arise from a damaged smile. Unfortunately, years of neglect due to homelessness and limited access to dental care, often coupled with drug abuse, result in our guests presenting some of these most difficult cases. But through your donations, prayers, and support, we’re able to make a huge dent in this issue. In 2016, over 1,600 patient visits occurred, with 600 volunteer hours contributed. Every year, we’ve been able to increase the number of patients seen, but with that comes a need for more volunteer dentists, supplies, and donations. Currently, we have 10 credentialed dentists rotating through the clinic, but this is not enough to keep up with demand. We receive 3-4 calls every day from people seeking help, but we just can’t take them all right now. Please consider a donation today to ensure that we can continue meeting the needs of so many men, women, and children who have nowhere else to turn. And please pray for the Lord’s provision as we seek out more dentists willing to selflessly volunteer their time on behalf of our neighbors in need.